Ashley focuses mainly on donor economic analysis. 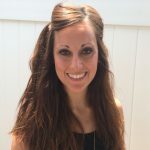 Prior to working at JDLA, Ashley has worked as a stay-at-home mom and as a compliance assistant at the BYU College of Nursing. She also has experience with the Noorda Foundation, awarding funding as part of her schooling experience, and has volunteered for the Circles Initiative helping families in poverty. She is passionate about using her God-given talents to bless the lives of others. Ashley studied Social Science Teaching before pursing her Masters in Public Administration with a nonprofit emphasis, both at Brigham Young University.